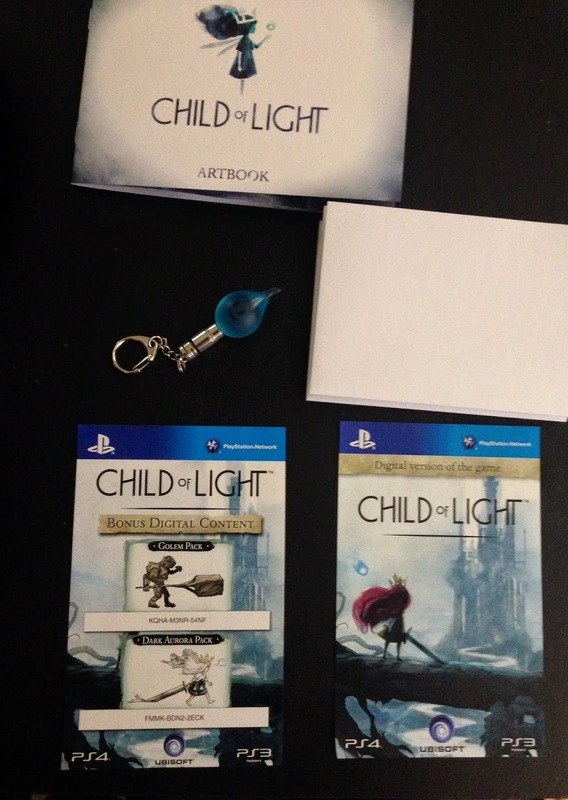 If you're wondering whether to go completely 100% digital for Child of Light or pay a little extra for all the bonus goodies, then consider this post your guide. Yesterday I bought Child of Light and it's great (first impressions coming soon!). I love physically having games and here in Australia it was only $10 more to get lots of goodies so I decided to get the Deluxe edition for $29.95 and I'm pleased to say I think it was worth it. The Child of Light Deluxe Edition comes in a smallish box (comparable to the size of an actual game cover) over an inch deep. It's got your usual photos and description that any game would have and also some photos of what's inside. The photos pretty much explain this part. What you're really interested in....What's inside! 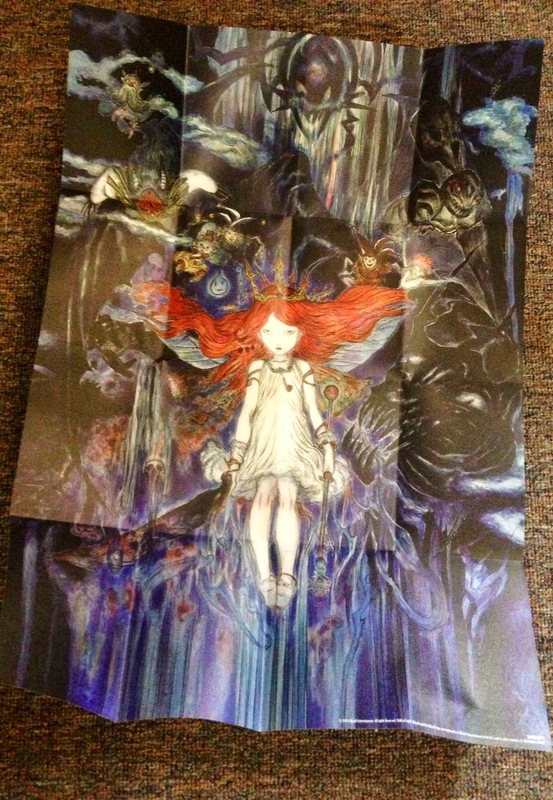 Artbook: The artbook is divided into four small sections: Aurora, Friends, Enemies and Environments. Each section is 4 page long, with the exception of the environments section (which rightfully has more pages than the rest). The photos in the book include concept art and the final art for the game and echo the stunning art of the game. Poster (pictured): this is apparently A2 sized...it's huge! It's a stunning artwork by Yoshitaka Amano who does a lot of promo art for Final Fantasy games. It's also worth noting that both the artbook and poster come with a matte finish which nicely compliments the watercolour art. 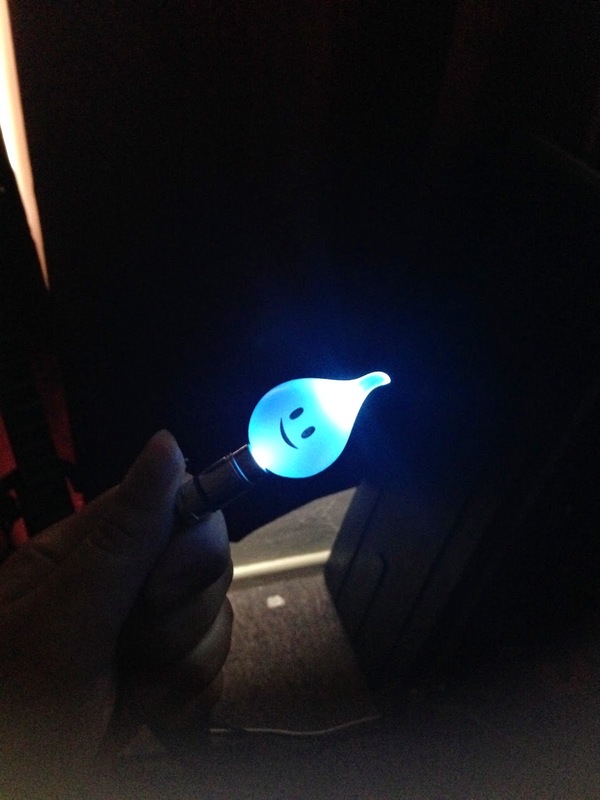 Igniculus keyring (picture taken in a dark room :)): This is so cute and I'm a sucker for things like this. It's a little keyring of Aurora's in-game friend, Igniculus. If you twist it, it lights up nice and bright! What I'm impressed about is that this doesn't feel cheap. Whatever they've used to make this feels thick and durable, which is always a nice touch when you've spent extra money. The final thing included in this are the codes for the DLC (which are Dark Aurora and Golem) and the full game of Child of Light. There is no disc, so even though you're paying extra, you will still have to download a 2.2GB file. What made me want to buy this is because not only is Child of Light a special game, it's also the first PS4 game I've been really excited for and I wanted to celebrate that fact. This is a quality deluxe edition and for everything you're getting, I would say it's pretty good value for money - if you consider the cost of DLC and how much it costs for artbooks when bought seperately, you'd be looking at least $40 for everything. If you haven't bought the game yet, this could be something fun to add to your collection. 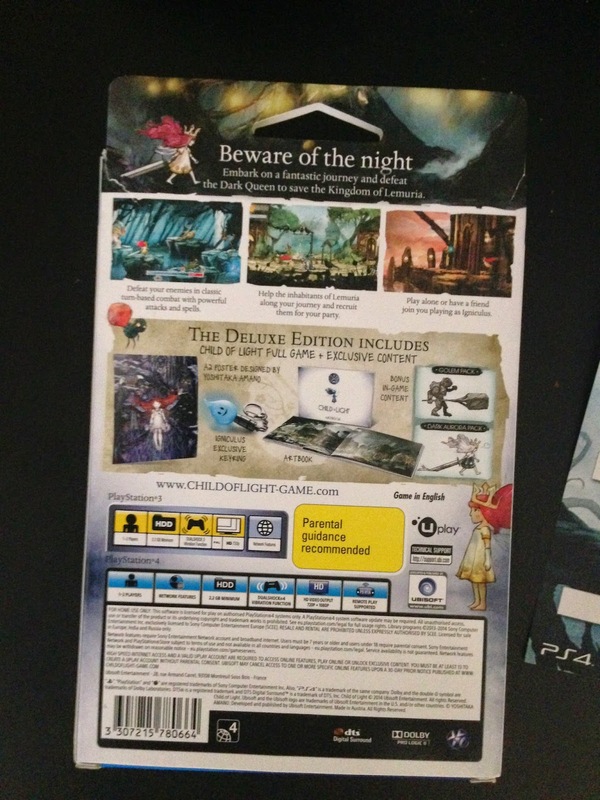 Let me know if you purchased Child of Light and what you think of the game. 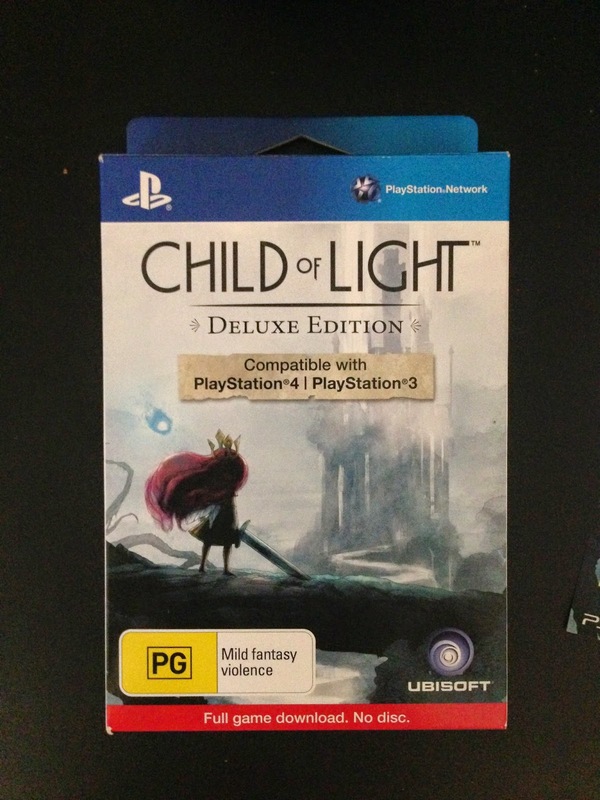 Child of Light is available on Playstation Network now for Playstation 4 and Playstation 3 and the Deluxe Edition is $29.95 at EB Games and JB Hi Fi in Australia.